The Cincinnati/Liuzhou Friendship Garden was realized in 2008 through a long-distance cooperation between professionals from both cities as a celebration of twenty years of cultural exchange within the context of the CinLiu Sister Cities relationship. 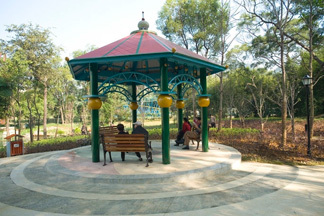 Design and operations partners in Liuzhou’s beautiful LongTan Park cooperated with a probono design committee in Cincinnati to conceive of and develop the garden. The Cincinnati team included project manager Gerald Checco, founding co-sponsor and cultural facilitator Beth Tu Hoffman, Human Nature, Kolar Design, Jim Fearing, Dewey Hollister, and Jan Brown Checco. Jan’s exchange artist partner was He Zhenhai of Nanning. Each artist created a mosaic inlay for the two main plazas in the garden design. Other notable features were replicas of the Roebling Bridge and Eden Park Gazebo. 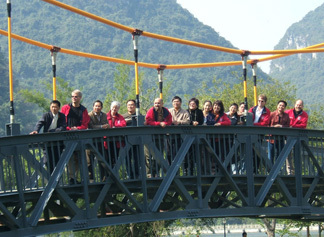 The garden was dedicated in November 2008 with a colorful celebration in the garden that included a re-signing of the agreement of relationship between Cincinnati and Liuzhou, attended by a Cincinnati mayoral delegation of 80 travelers to China. Jans’s Plaza Mosaic: “Ohio River Valley Portrait” (2008) The high places (spirals), low places, forests, fields and rivers (the blue bands) are overlain with man’s imprint of habitation and use. This basic “portrait” of the face of our homeland has not changed since the time when the only inhabitants were Native Americans. The beautiful face of Cincinnati bears the marks of our collective creative energy. Drawn by David Whitaker of Human Nature, this plan was one of three developed by the volunteer design committee, and offered to our Liuzhou partners for review. 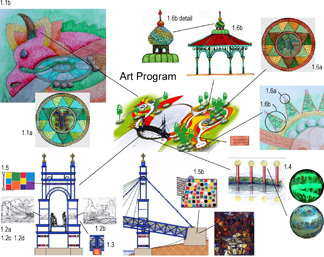 They liked the pictorial and storytelling nature of this plan which links a garden of the Dragon City (Liuzhou) to the garden of the Queen City (Cincinnati) with an bridge, symbolic of our friendship and embodied by Cincinnati’s iconic Roebling Bridge. Initial suggestions for art programming, designed by Jan Brown Checco. Jim Fearing designed the structure of the mini-Roebling Bridge. This design that suggests the gazebo in Eden Park is based on Jan’s sketch, but modified by the Liuzhou team to suit their aesthetic sense. 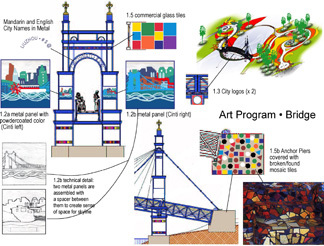 This conceptual design sheet suggests mosaic applications and wrapping steel bands on the columns of the bridge, representing each of the cities’ urban profiles. These embellishments remain to be applied. Members of the Design Team from both cities gather on the bridge to celebrate their shared creation of the garden.